Pictured, Qasid students on a field trip in Wadi Rum, Jordan. Thinking about coming to Qasid? Get all the information you need before applying! Qasid's core program is our two-track division into Classical and Modern Standard Arabic. Immediate specialization is the fastest and most effective way for students to move towards mastery. Its then with this in mind, that Qasid offers two full-time tracks to accomodate students with a myriad of needs and goals. Modern Standard refers to the standard literary and communicative language of the Middle East and North Africa, recognized as one of the UN’s six official languages. It is the common medium for nearly all formal communication, both printed and spoken. 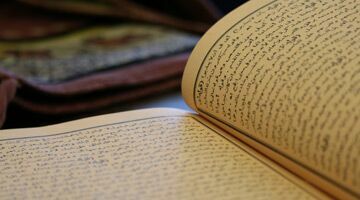 Classical Arabic refers primarily to the language of the Qur’an, and secondarily to the various texts and works that are directly inspired by both its form and content. Students receive direct exposure to Islamic legal, theological / philosophical and mystical texts from the classical and medieval periods. 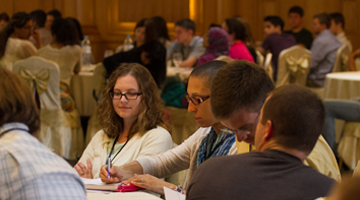 Because of the wide-ranging backgrounds and areas of expertise of Qasid’s instructors, we are able to offer customizable educational packages to diplomats, as well as corporate and student groups. These can be arranged at any time of the year, and do not need to correspond to our established, normal-year academic calendar. 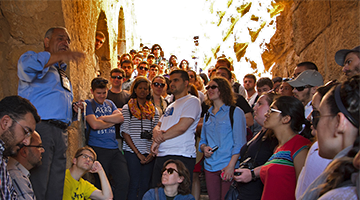 Qasid hosts students belonging to a variety of nationalities, professions and faiths. Our admissions criteria focus as much on leadership and skills demonstrated through civic involvement as much as they do on GPA, giving birth to an elect student body representing extraordinary diverse perspectives. Qasid’s skills class forced me not only to speak, but also start thinking in Arabic, and made me less self-conscious about my mistakes and more comfortable expressing myself in Arabic. Also speaking with my neighbors and the Qasid staff every day made me more confident in my basic conversation skills. I found Qasid’s curriculum to be unique in its ability to convey an understanding of how and why the language works. Additionally, living in Amman for a summer gave me the opportunity to practice what I was learning in class in real life situations. The best part of the Qasid experience is having the opportunity to learn from such incredible Arabic instructors! I found Qasid’s program and schedule more convenient than my experience in Cairo because of the consistency. Also, I actually had more chances to speak Arabic with the local population in Amman than I found in with my experience in Egypt. Overall, I found Qasid a more effective program geared towards my goals as an Arabic learner.